As anyone that has had experience with Windows knows…. there is no way to keep a process running with a set priority level… until Prio came along. Before, you would have to just do it manually and know that the next time you booted up… that process was going back to the original state. But no more! 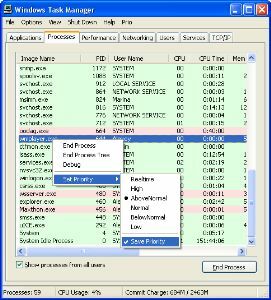 Prio can change the Task Manager so that you can actually save the priority states for each of the processes. It even does digital signature checking, along with a new services tab that allows you to take care of services and a TCP/IP tab that shows you statistics for incoming and outgoing traffic. Really cool stuff, and free for personal use … obviously for Windows.